Winter is quickly approaching, friends. I hope you have unpacked your big, winter bombers, and puffy, down coats because it’s almost time for snow storms and cold weather to be our new normal for a season. My husband and I have been in the process of moving, so we’re late to the winter decorating game as a result of it. However, that has not stopped me from adding pins on Pinterest and developing mood boards to get an idea of how we’d like to decorate the place for the holiday and winter season. It’s funny how a few years ago, you would not catch me being so concerned with decorating for each season, but now it’s something that I find so exciting and something that I truly enjoy. Recently, it was brought to my attention that one of the Douglas Elliman (a global real estate agency) offices in Florida is promoting an interior decor challenge called the Winter Style Board Challenge. 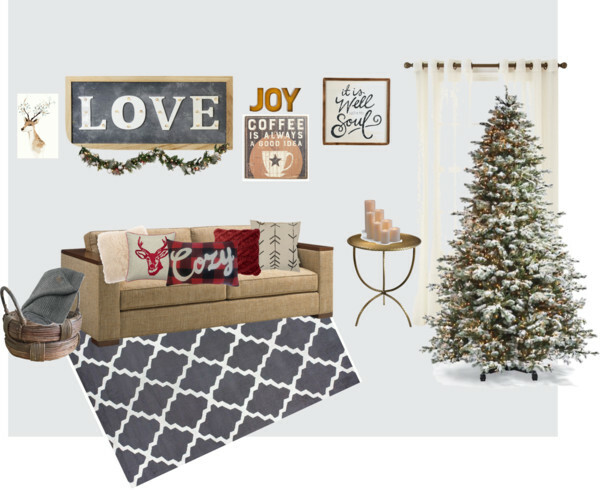 I have already been looking into ways to decorate our new apartment together for winter, so it seemed like a wonderful opportunity to share some of the ideas I have with all of you! While we have not quite had the opportunity to decorate the place like we want to because we’re still moving and unpacking the smorgasbord of items we’ve accrued over the years, I thought I would share some of the ideas we’re planning on bringing to life in our first place together with the intent of revealing the finished product, room-by-room at a later date. I am also going to include some tips for winterizing your place in preparation for a new, colder season. Keep in mind that these images are not to scale and are not actual representations of the precise layout of our apartment. It’s merely a representation of some of the ideas we have regarding color schemes, style and decorations. Let’s start with our living space! One of the things I loved about this living room style is it’s rustic yet simple – which I would say describes my decor style to a tee! There are small accents of different things and the colors they use really complement the space, nicely. We also have light-grey walls in our apartment, so it’s nice to see an example that gives me an idea of how we can spruce up our space while keeping it simple. However, if I am being realistic about our budget and the layout of our apartment, even our desired look will look different, but it will be perfect for our cozy space. For example, while we’d love a white or ivory-colored couch, my adorable cat will stain it and ruin it with all of her hairball coughing and throwing up. So instead, we’re looking to use our futon and simply add a tan colored futon cover instead. What makes this perfect for winter? It’s a perfect palette for every season! However, the light grey walls are perfect for winter because they fit the icy, coldness of the season and matches whatever decor you throw it’s way. Decorating for Christmas? This light grey would look lovely paired with Christmas plaid and evergreen. Changing things up in your place to celebrate Valentine’s Day? Add some hues of deep red and go for it! Aside from the wall color, the decor used around the space looks warm and inviting, but also very appropriate for the season. White, grey, icy blue are all colors that are perfect for the winter months as they are reflective of some of the colors you’d typically see outside during that season. While I am definitely planning to add some icy blue colors for the winter, since we’re smack dab in the middle of the holiday season, I am planning on including some holiday decor and seasonal red colors. Invest in some really cozy, warm blankets. You’re cold feet and legs will thank me later. Don’t forget to winter-proof your house! Fill in or patch up any spaces in around the sills of the windows, so that when the temperature outside drops, your apartment will stay cozy. If your kitchen and living room are really close together like how it is in our apartment, don’t hesitate to spread out some of the decor. If you have a lot of wall space, use it, but don’t feel the need to have them completely full with pictures. I like the idea of frame galleries on wall because you can put up a lot of images without clogging up space on your walls. 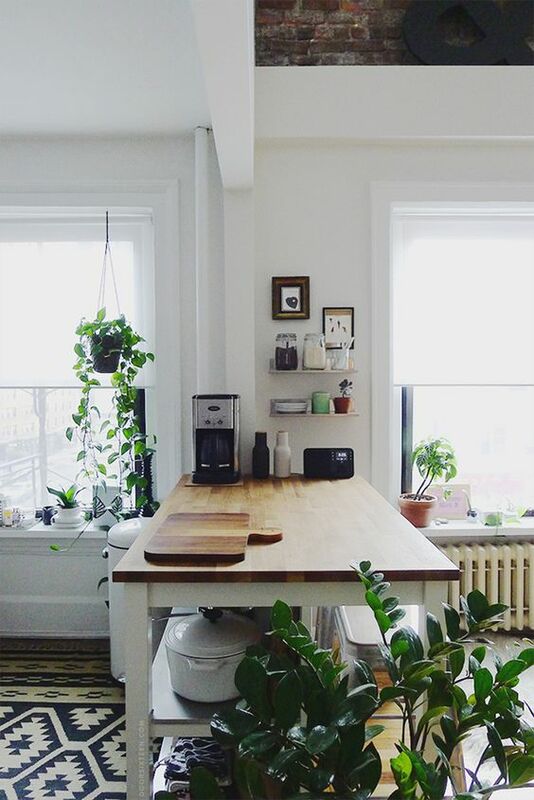 The kitchen is by far one of my favorite places in homes. It’s one of the many places where we spend quite a lot of our time because we both love to eat and drink copious amounts of coffee and tea. In fact, one of the seller points for me was the kitchen and the fact that they said we would be getting updated cabinets. While I love a good DIY activity and watching HGTV as much as the next person, I definitely preferred to have an already updated unit that we did not have to worry about doing much to keep nice. 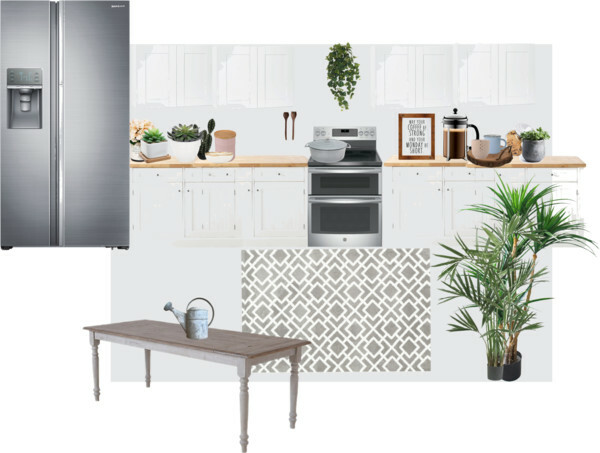 While our kitchen doesn’t look exactly like this, I tried choosing an image that would be as close to what we’re going for in regards to decorating it for the winter. 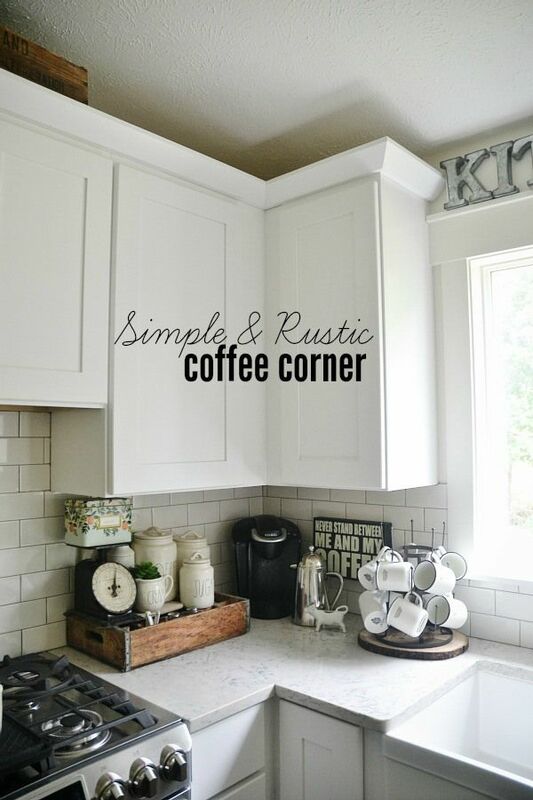 What I love most about this place is their use of space and how they’ve added simple rustic accents that really spruce up the kitchen. The table in this example looks quite identical to the country table I got from the thrift store over a year ago! We don’t have as much space in the kitchen, but we have some space between that and the living room that would be a nice area to place our table. While I have included some pops of greenery, one of the things that makes this great for winterizing your home is the icy pops of color that I chose. Icy blues (and even sometimes icy pinks) are great for the winter and blend well with the sometimes icy weather outside. The other thing that makes this a perfect style for the winter months is that even if you do not have a naturally bright kitchen, these colors will immediately make it appear brighter. Winter is known to be a season where people often acquire seasonal depression due to the fact that the days are shorter and the sun isn’t out as long. I would definitely recommend finding ways to keep your space cheerful and bright during these months. Are you a heavy coffee or tea-drinker? Create a coffee nook by either purchasing a bar cart or moveable counter and add all of your coffee necessities on top of it. If you would rather not purchase a new item, allocate a small spot or corner in your kitchen and create your nook there. Not only does it look nice, but it’s functional because you’ll have everything you need in that one place (with the exception of liquid creamers). I’ve discovered that the more neutral you go with colors, the easier it will be to spruce up your space for the seasons because you’d really only have to add a few accents and switch out a few things rather than completely overhauling your entire space every season (which can be both time-consuming and expensive). If you don’t have a ton of windows in your kitchen to brighten up during the winter months, add some whites, icy blues, gold or silver, and for a sharp contrast – evergreen. The whites and icy colors will brighten up the space and the evergreen will contrast it so it appears even brighter against the dark green color. This where plants work wonderfully! If you’re not someone who likes watering plants every other day, invest in some fake ones. There are some really impressively realistic ones that will give you the look you desire without the maintenance. I actually purchased fake flowers from Michael’s for my bridal bouquet and they looked great! I love cozy bedrooms. While I’ve always wanted to have an office space or an office nook in our space together, our bedroom is a bit too tiny for that. One way I plan on working through that is finding some sort of storage unit that can double as desk. If not, it’s not a big deal considering I usually write in coffee shops, on my bed, or on the couch anyway. What I loved about example bedroom is their use of space and pillows! I love pillows and although my husband expressed that he doesn’t see a point in them when it’s not like we’ll sleep on them, I love the appearance of them. Personally, it makes the bed appear cozier to me. The bouquet on the table is actually very similar to my bridal bouquet, which is why I included it. I would really like to include it in my bedroom somewhere, if space permits. Other than the extra pillows contributing to the warm, and the color scheme that I’ve discussed in previous rooms, the accents of gold, I believe are perfect for the winter season. While I definitely think gold looks well with almost anything and works wonderfully in the fall, it wasn’t until recently that I realized how nice it looks with winter color palettes as well. 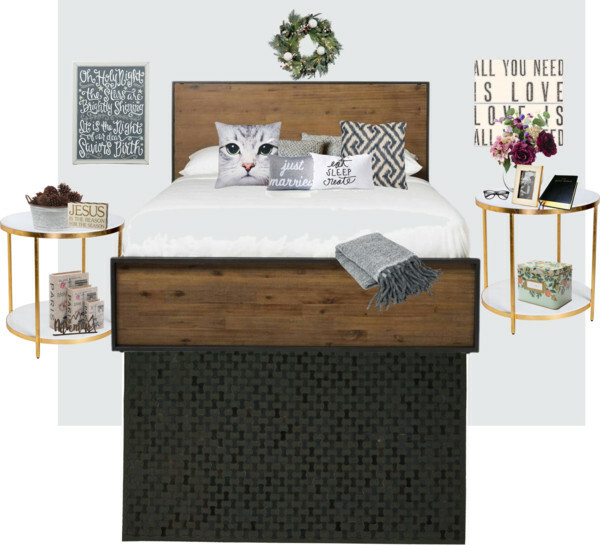 The evergreen rug under the bed is perfect for the winter – especially if you have hardwood or tiled floors, because it gets very chilly during the winter season. I think I can speak for us all when I say that waking up on a weekday is much harder when you’re stepping onto a cold floor. Make sure to include curtains in your bedroom that help block out some of the light during the day. Although in winter there isn’t much of it, when the sun does shine in the morning, it’ll shine right into your bedroom. Unless you’re okay with the natural alarm clock (there’s nothing wrong with that), I would invest in some cozy ones. For small bedrooms, one thing to make your space appear bigger is to keep things tidy and organized. I had a very small bedroom during my childhood years, but what often made it appear bigger was when it was cleaned up. Same thing with the studio I once owned. When I let it get messy, it appeared much smaller than it actually was. If my mom is reading this, she’s probably really happy to hear that I learned this from her. 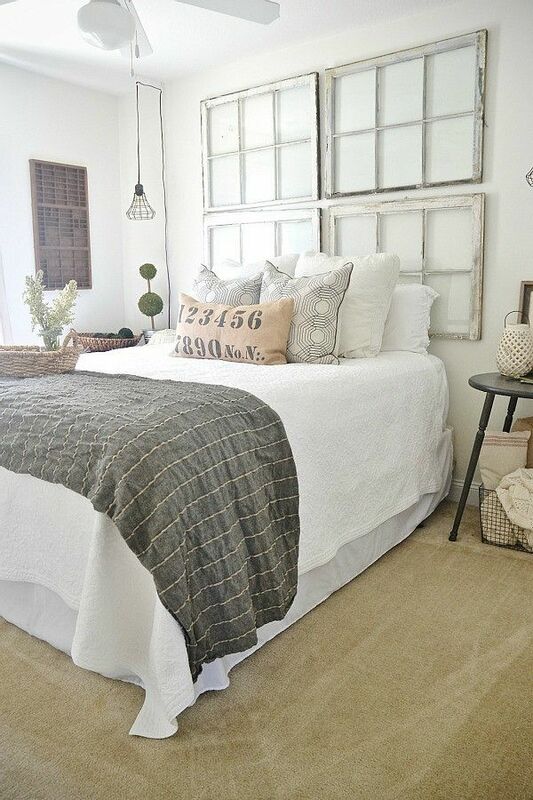 If you’re not looking to overhaul your entire bedroom, accent your space with a nice blanket or throw blanket! You would be surprised how little pops of seasonally appropriate colors can really add some life to your space. Now that I’ve shared with you some of the ideas roaming around in my bed heading regarding styling our new apartment, I am looking forward to sharing with you the finished results after it’s all finished! As idealistic as I can be, I know that realistically speaking, these rooms won’t look identical to the spaces I’ve created online. Nonetheless, I am really excited to share the final reveal, room by room in the future. Well, those are my suggestions for the perfect winterized home, but I’d love to hear some of yours! Feel free to tell me in the comments what your favorite look was and what you plan on doing to spruce your space up for the winter season!